Isaac Mwendia was at a party near his home in Mulathankari, Meru, when he was struck by something he couldn’t quite put his finger on. It was a mix of envy and wonder as he watched the deejay playing to an energetic crowd. He didn’t know it then, but this was to be the start of a rather interesting journey into the world of music. Since childhood, Isaac had been interested in music and electronics, almost ruining his father’s radio as he tried to find the source of the voices he heard. It was at that party, on a whim, that he decided he would one day mix music like a real deejay. “Usually I see something, and when I go home I’ll think about how I can create it. That’s what happened with the deck. I saw the deejay playing at that party and I told my friend I was going to build something like that,” he says. His friend, perhaps accustomed to hearing Isaac speak about his crazy ideas, didn’t believe him. He dismissed the idea as the product of Isaac’s fanciful mind. But something else had changed the direction of the young man, whose favourite subject in high school was physics. His parents could no longer afford his school fees and he had had to drop out of high school. “I have always loved music, and when my family couldn’t afford to pay my school fees, I knew it was something I could pursue to earn some money,” says Isaac. So he decided he was going to do something that would bring together his love of music and the sciences; something that could earn him some money while indulging his passion. “I would wake up every day and go out looking for old and broken radios. I would ask anyone, from my friends to the neighbours. Some would willingly give me (old pieces of equipment), and others would ask me to give them ‘kakitu’ (some cash) in exchange for it,” he adds. His persistence was enough to arouse his neighbours’ curiosity. What was the young man planning to do with the mass of green circuit boards, knobs, switches and the other electronic debris that he was quietly accumulating? One friend gave him a sack containing the remains of six radios. Isaac paid KES30 for this load of good fortune, and he got to work. 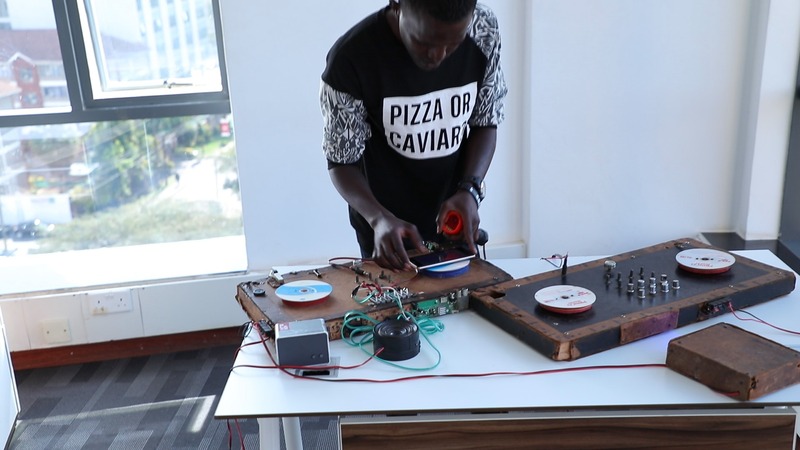 “Radio moja haikuwa mbaya sana so nikaifix na hio ndio nilianza kuplay ngoma nikicontrol na equalizer (One of the radios wasn’t in very bad shape, so I fixed it and started using it to play music, using the equalizer to control the sound),” says Isaac. It took him one month to put together this contraption. The device is basically a mixer and an amplifier, with the music played from mobile phones and the mixer being used to switch between the sources of music. The body of an old flashlight housed the microphone. It wasn’t as shiny or as complicated as the big-name models, but it worked – at least most of the time. His initially pessimistic friend was the first person Isaac showed the progress he was making with his DIY turntable. “It was funny. He didn’t believe me at first, but when he saw the deck, he started making calls to all our friends,” he recalls, musing about how he ended up hosting his first concert. “Tukaita wasee concert (We called our friends for a concert),” recalls the young deejay. Roughly 50 people turned up, and Isaac and his friend made about KES 5,000 by charging a small entrance fee and selling his mixtape to the small crowd. This was in 2013, and that was a lot of money for a 17-year-old. Encouraged by the reception to his music, he began to fashion himself as a self-made deejay, later acquiring the moniker “DJ Boboss”. Because of his love for dancehall music, specifically the work of Jamaican artist, producer and performer Adidja Azim Palmer, popularly known as Vybz Kartel, he also acquired the nickname Kartel. DJ Boboss would later find a radio frequency covering a radius of 400 metres. Now every week, his friends and neighbours tune in to listen to him play for two hours. It’s a small audience of about 20 people; but it’s a very loyal and highly engaged audience. “Wanapenda mix zangu sana, watu hu-text mashout-outs kwa mabeshte zao na wengine hu-request ngoma pia (They enjoy my sets a lot, and people even text me with shout-outs for their friends, and others request songs),” he says. Not content with the first version of his turntable, Isaac has been improving his skills, and the decks with which he wows audiences now are the fourth and fifth variations he has developed. In June, he tasted a little more fame than he was used to when Safaricom’s Twaweza Live concert auditions came to Meru. It was a chance to showcase his unconventional skills, and showcase them he did when he stood before the judges. Nobody in the room was prepared for what he was about to do, and when he began his set, playing from his homemade turntable, the entire room roared in applause. That audition sparked off a chain of events, with a video shared on Twitter and Facebook raising his profile enough for mainstream media houses to interview him, publicity that is in turn allowing him to book more gigs – and make more money. Understandably, DJ Boboss is extremely proud of his achievements, and plans to continue building his own deejaying decks. His advice to fellow youth? “Setbacks are temporary. Success is a matter of innate talent and being daring enough to take chances, without the fear of what others will say or think of you,” he says. “I’m not ready for that right now. If I was to make decks for someone, maybe I would charge KES700,000,” he says. It seems crazy, but don’t all great ideas start off a little crazy anyway?